The moving average is a common trading indicator. Traders both use and misuse them. At times, they even abuse them. 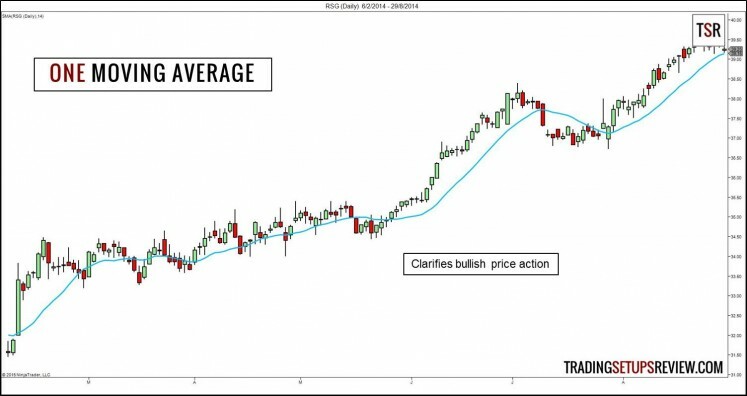 The result is a myriad of trading myths surrounding the topic of moving average. 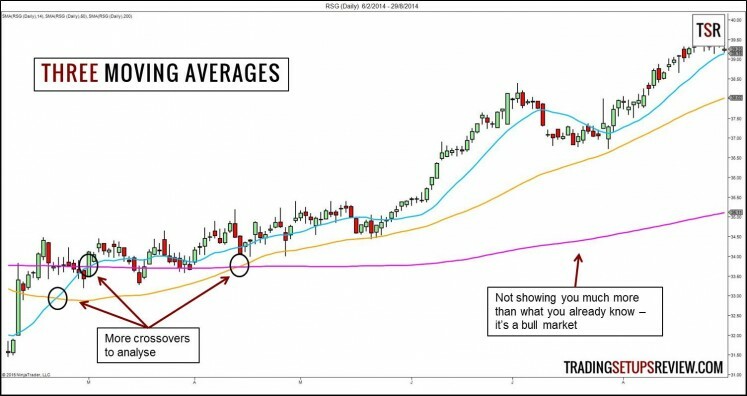 Let’s dispel four major myths about moving averages here. #1: The more moving averages, the better. Remember the rule of diminishing returns. It applies to the indicators you place on your charts. Every indicator you add to your chart provides less value than the one before it. The first moving average helps to clarify price trend and adds great value to a naked chart. The second moving average enables MA crossover signals. But at the same time, it might produce conflicting signals about the price trend. The third moving average adds an extra trend perspective. But do you really need it? Not to mention that it increases the potential for confusion. 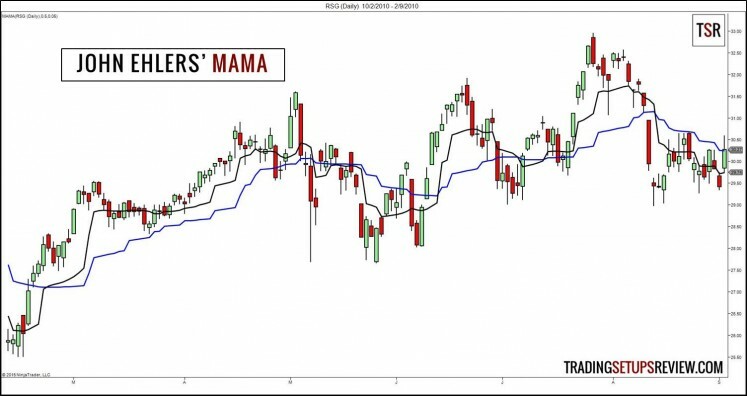 #2: The moving average defines the market trend with 100% accuracy. The moving average is an incredible tool for clarifying the market trend. Its slope and its position relative to price tell us a lot about the price trend. But don’t forget that it is a lagging indicator. It shows a trend only after it develops, and might continue to indicate a trend that has already ended. 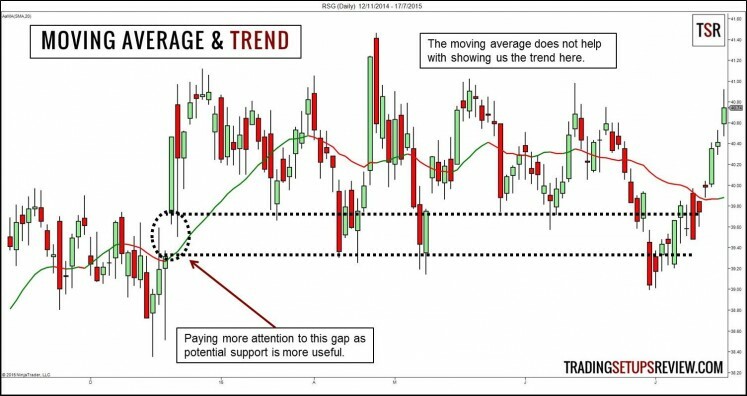 The moving average is a useful guide to the market trend. But it is not definitive. Do not rely on the moving average as the definitive guide. In some markets, a moving average might be more useful as a counter-trend indicator. Pay attention to the market structure and price momentum for clues. #3: There is a magical look-back period for moving averages. These are common look-back periods for moving averages. They are not fixed, and are not magical. Do you think that a 200-period moving average is correct? And that a 201-period moving average is wrong? If so, you are either obsessed over the number 200 or simply does not understand how to use a moving average. If your trading edge shatters due to a slight look-back period change, you didn’t have an edge to begin with. However, I don’t mean that the moving average period does not matter. It does. Don’t dwell on specific look-back periods. It makes more sense to talk about short-term, intermediate, and long-term periods. Short-term moving averages is a close proxy of price. 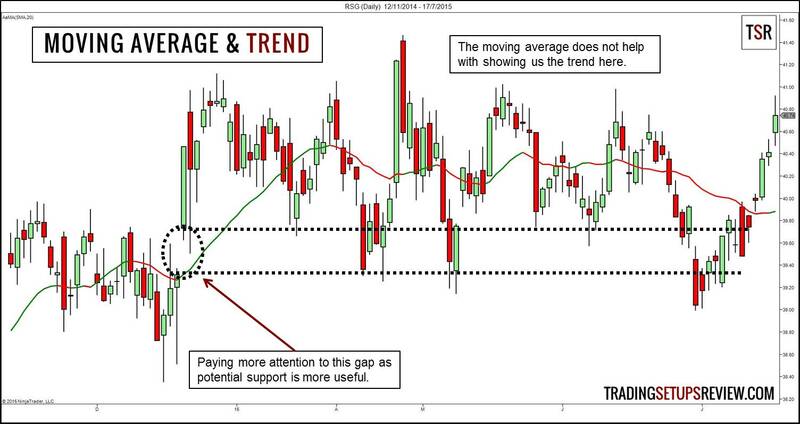 Intermediate moving averages track short-term trends. Long-term moving averages show the established trend that most traders can spot easily. It is easy to give extreme examples of each. 9 is short. 50 is intermediate. 200 is long. 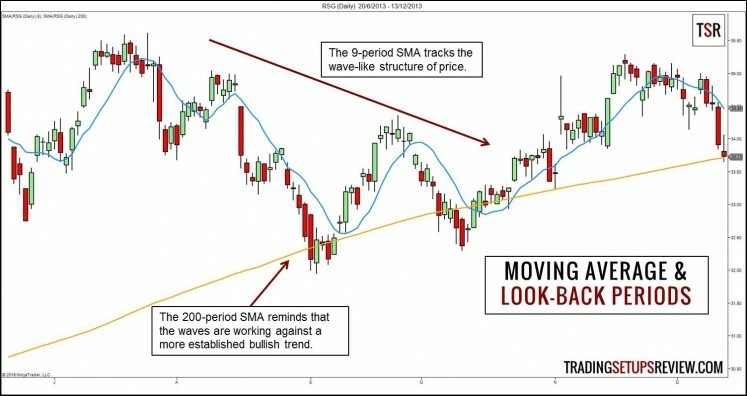 But at which look-back period does a moving average ceases to be short-term? Or turns from long-term to intermediate? There are no clear answers. It’s a gray area. When trading with a moving average, don’t let this gray area bog you down. Also, don’t let any specific moving average period convince you that it is magical. #4: The more complicated the moving average formula, the better. Has it occurred to you that the moving average has acquired the pre-fix “simple”? We have the simple moving average. But we don’t have the simple MACD, the simple Bollinger Bands, or the simple RSI. There are too many non-simple moving averages out there. Exponential, Weighted, Triangular, Jurik, Hull, MESA Adaptive Moving Average (MAMA). The “simple” pre-fix identifies the original moving average, and distinguished it from its more complex cousins. 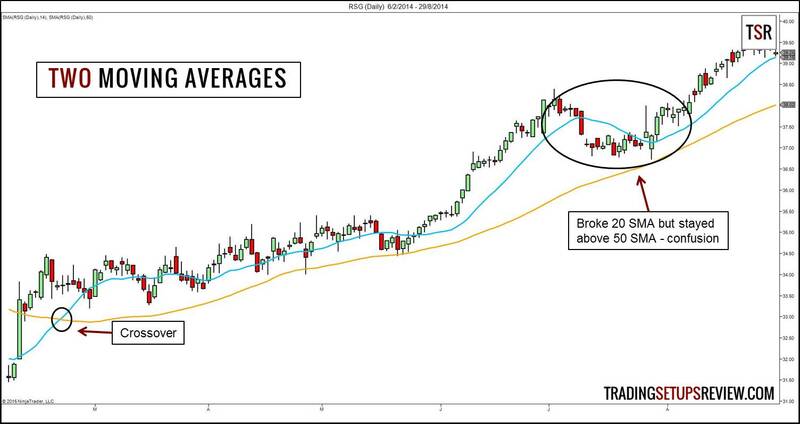 Moving averages with complicated formulas are not better. But they are not evil. They are just different. They respond differently to price action. Don’t get excited when you hear about a complicated indicator. Get familiar. Learn how to use it. Depending on how well you learn, it might be a better tool for you. If you think that the moving average is all you need, you are deifying it. No one indicator is omnipotent, not even complicated ones with the magical look-back period. Never ever forget to look at price. You cannot buy and sell at the value of the moving average. You can only trade at the market price. Learn to read price.